The 1954 United States House of Representatives elections was an election for the United States House of Representatives in 1954 which occurred in the middle of President Dwight Eisenhower's first term. 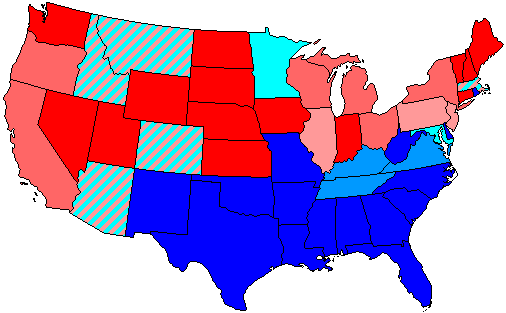 Eisenhower's Republican Party lost eighteen seats in the House, giving the Democratic Party a majority that it would retain in every House election until 1994. Perhaps the major reason for the Republican defeat was the backlash against the Army-McCarthy Hearings, in which prominent Republican Senator Joe McCarthy accused countless political and intellectual figures of having Communist ties, usually with no evidence. Another issue was the Dixon-Yates contract to supply power to the Atomic Energy Commission. Sam Rayburn of Texas became Speaker of the House, exchanging places with new Minority Leader Joseph W. Martin Jr. of Massachusetts; they went back to what they had been before the 1952 U.S. House elections. Notable freshmen included future House Speaker Jim Wright, future Senator Ross Bass, future Secretary of the Interior Stewart Udall, future Governor of Kansas William H. Avery, and future Lieutenant Governor of Michigan Martha Griffiths. Alabama 9 Laurie C. Battle Democratic 1946 Incumbent retired to run for U.S. Senator. Arizona 2 Harold Patten Democratic 1948 Incumbent retired. California 6 Robert Condon Democratic 1952 Incumbent lost re-election. California 12 Allan O. Hunter Republican 1950 Incumbent lost re-election. California 13 Ernest K. Bramblett Republican 1946 Incumbent retired. California 26 Sam Yorty Democratic 1950 Incumbent retired to run for U.S. Senator. Delaware at-large Herbert B. Warburton Republican 1952 Incumbent retired to run for U.S. Senator. Florida 1 Courtney W. Campbell Democratic 1952 Incumbent lost re-election. Florida 4 Bill Lantaff Democratic 1950 Incumbent retired. Georgia 4 Albert Sidney Camp Democratic 1939 Incumbent died July 24, 1954. Georgia 8 William M. Wheeler Democratic 1946 Incumbent lost renomination. Illinois 3 Fred E. Busbey Republican 1950 Incumbent lost re-election. Illinois 12 Edgar A. Jonas Republican 1948 Incumbent lost re-election. Illinois 25 C. W. Bishop Republican 1940 Incumbent lost re-election. Indiana 8 D. Bailey Merrill Republican 1952 Incumbent lost re-election. Iowa 1 Thomas E. Martin Republican 1938 Incumbent retired to run for U.S. Senator. Kansas 1 Howard Shultz Miller Democratic 1952 Incumbent lost re-election. Kentucky 8 James S. Golden Republican 1948 Incumbent retired. Maryland 5 Frank Small Jr. Republican 1952 Incumbent lost re-election. Massachusetts 8 Angier Goodwin Republican 1942 Incumbent lost re-election. Michigan 3 Paul W. Shafer Republican 1936 Incumbent died August 17, 1954. Michigan 6 Kit Clardy Republican 1952 Incumbent lost re-election. Michigan 13 George D. O'Brien Democratic 1948 Incumbent lost renomination. Michigan 17 Charles G. Oakman Republican 1952 Incumbent lost re-election. Minnesota 9 Harold Hagen Republican 1944 Incumbent lost re-election. Missouri 4 Jeffrey P. Hillelson Republican 1952 Incumbent lost re-election. Missouri 6 William C. Cole Republican 1952 Incumbent lost re-election. Montana 2 Wesley A. D'Ewart Republican 1945 Incumbent retired to run for U.S. Senator. Nebraska 1 Carl T. Curtis Republican 1938 Incumbent retired to run for U.S. Senator. Nebraska 2 Roman Hruska Republican 1952 Incumbent retired to run for U.S. Senator. New Hampshire 2 Norris Cotton Republican 1946 Incumbent retired to run for U.S. Senator. New Jersey 4 Charles R. Howell Democratic 1948 Incumbent retired to run for U.S. Senator. New Jersey 14 Edward J. Hart Democratic 1934 Incumbent retired. New Mexico at-large Antonio M. Fernandez Democratic 1942 Incumbent re-elected. New York 8 Louis B. Heller Democratic 1949 Incumbent resigned July 21, 1954 to become judge of New York City Special Sessions Court. New York 20 Franklin Delano Roosevelt Jr. Democratic 1949 Incumbent retired to run for New York State Attorney General. New York 21 Jacob K. Javits Republican 1946 Incumbent retired to run for New York State Attorney General. North Dakota at-large Otto Krueger Republican 1952 Incumbent re-elected. Ohio 9 Frazier Reams Independent 1950 Incumbent lost re-election. Ohio 13 Alvin F. Weichel Republican 1942 Incumbent retired. Ohio 15 Robert T. Secrest Democratic 1948 Incumbent resigned September 26, 1954 to join Federal Trade Commission. Ohio 21 Robert Crosser Democratic 1922 Incumbent lost renomination. Ohio 23 George H. Bender Republican 1950 Incumbent retired to run for U.S. Senator. Oregon 3 Homer D. Angell Republican 1938 Incumbent lost renomination. Pennsylvania 11 Edward J. Bonin Republican 1952 Incumbent lost re-election. Pennsylvania 19 S. Walter Stauffer Republican 1952 Incumbent lost re-election. Pennsylvania 25 Louis E. Graham Republican 1938 Incumbent lost re-election. Tennessee 6 James Patrick Sutton Democratic 1948 Incumbent retired to run for U.S. Senator. Texas 5 Joseph Franklin Wilson Democratic 1946 Incumbent retired. Texas 12 Wingate H. Lucas Democratic 1946 Incumbent lost renomination. Texas 14 John E. Lyle Jr. Democratic 1944 Incumbent retired. Texas 15 Lloyd Bentsen Democratic 1948 Incumbent retired. Texas 16 Kenneth M. Regan Democratic 1947 Incumbent lost renomination. Virginia 9 William Creed Wampler Republican 1952 Incumbent lost re-election. West Virginia 4 Will E. Neal Republican 1952 Incumbent lost re-election. Wisconsin 5 Charles J. Kersten Republican 1950 Incumbent lost re-election. Wyoming at-large William H. Harrison Republican 1950 Incumbent retired to run for U.S. Senator.